Project obstacles and solutions: The U.S. 31 Project is a highway improvement project between I-465 on the north side of Indianapolis and the U.S. 20 bypass in South Bend, Indiana. The project will convert the thoroughfare into a freeway, eliminating all stoplights and unramped entryways over 122 miles. As part of the southern leg of the U.S. 31 Project, a new flyover ramp was constructed for traffic traveling southbound and exiting onto I-465 eastbound. Halverson Construction was contracted to build the new ramp and two flyover bridges. Unique to this project was the construction of the hammerhead piers. The intersection of U.S. 31 and I-465 is a gateway into the city of Indianapolis from Carmel, Indiana. The architect designed the piers with a textured finish. The piers were cast in place and the forms used a textured wrap to achieve the desired look. The concrete used in the forms had to meet both strength requirements and be aesthetically pleasing when the forms came down. Halverson worked with IMI QC/QA to design a mix that would pass INDOT structural specifications and would mold to the textured wrap. IMI submitted a mix design to INDOT engineers that had a higher slump concrete that incorporated a mid-range water reducer in the concrete. This allowed the concrete to be poured at an 6 inch slump without adding extra water to the mix and weakening the strength. IMI supplied nearly 1,200 yards of concrete for this project. The three piers and footings were poured with 570 yards of the high slump concrete. The decks and walls were poured with 600 yards of concrete. 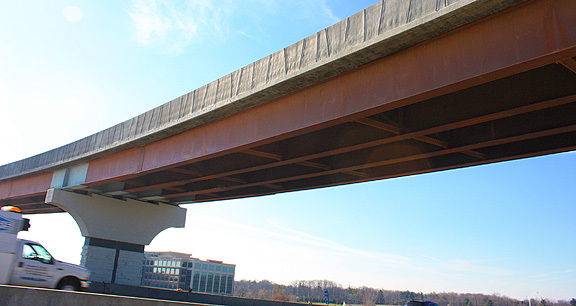 The flyover ramp and bridges opened on December 18, 2014. For more information on using water reducers in your concrete, contact your sales representative. Click here.